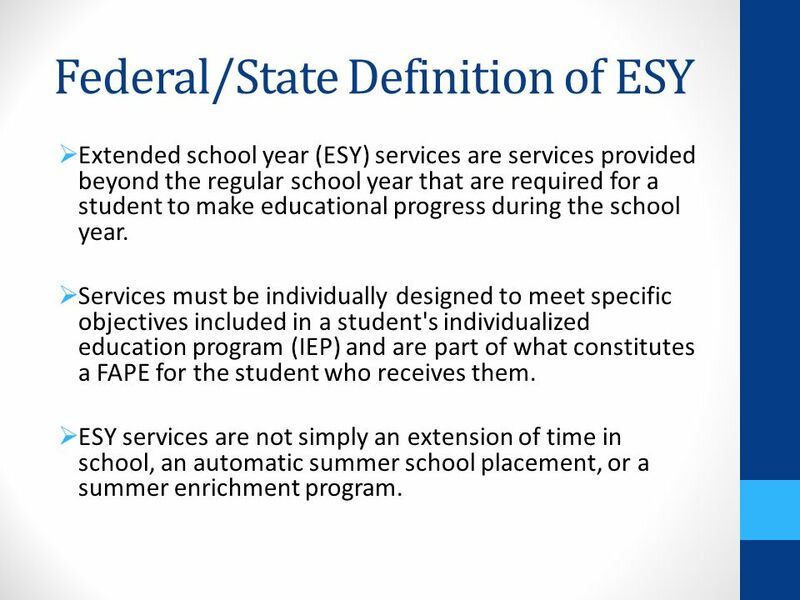 Extended school year (ESY) services are services provided beyond the regular school year that are required for a student to make educational progress during the school year. Services must be individually designed to meet specific objectives included in a student's individualized education program (IEP) and are part of what constitutes a FAPE for the student who receives them. ESY services are not simply an extension of time in school, an automatic summer school placement, or a summer enrichment program. 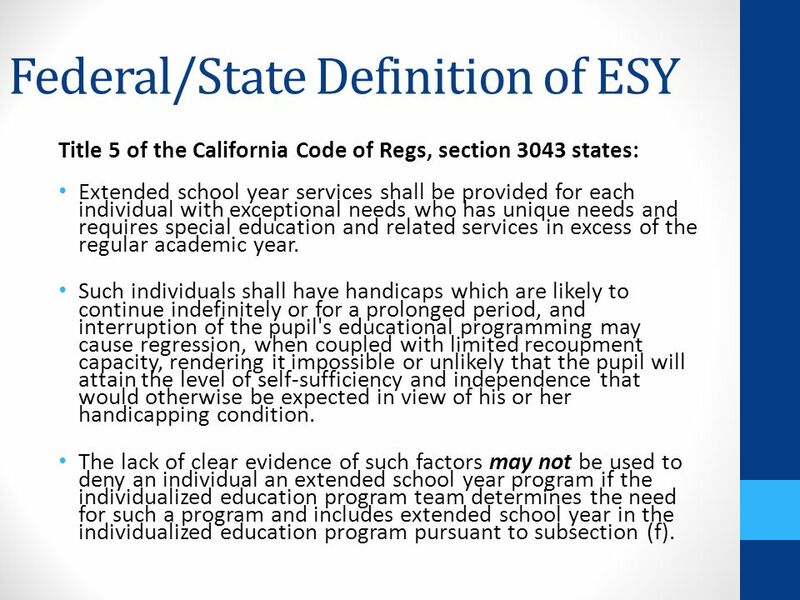 Title 5 of the California Code of Regs, section 3043 states: Extended school year services shall be provided for each individual with exceptional needs who has unique needs and requires special education and related services in excess of the regular academic year. Such individuals shall have handicaps which are likely to continue indefinitely or for a prolonged period, and interruption of the pupil's educational programming may cause regression, when coupled with limited recoupment capacity, rendering it impossible or unlikely that the pupil will attain the level of self-sufficiency and independence that would otherwise be expected in view of his or her handicapping condition. The lack of clear evidence of such factors may not be used to deny an individual an extended school year program if the individualized education program team determines the need for such a program and includes extended school year in the individualized education program pursuant to subsection (f). 4 SUMMER SCHOOL OR ESY? 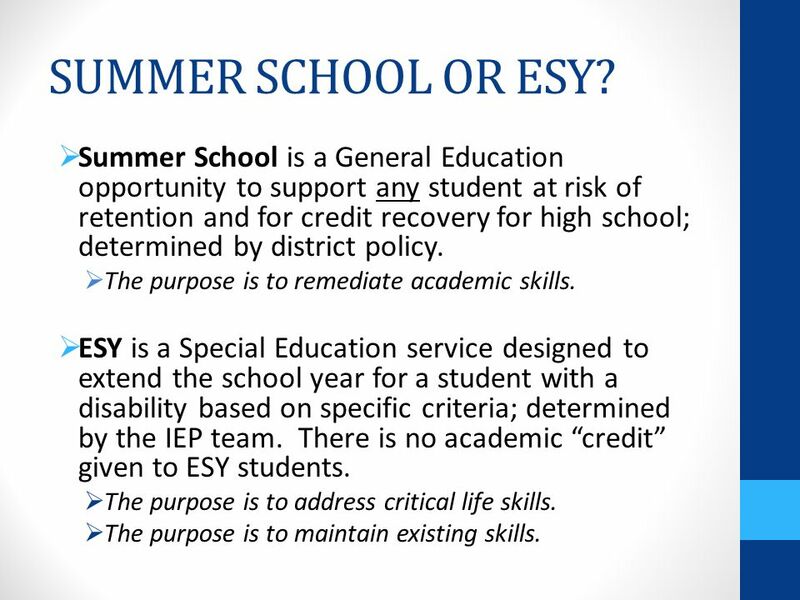 Summer School is a General Education opportunity to support any student at risk of retention and for credit recovery for high school; determined by district policy. The purpose is to remediate academic skills. 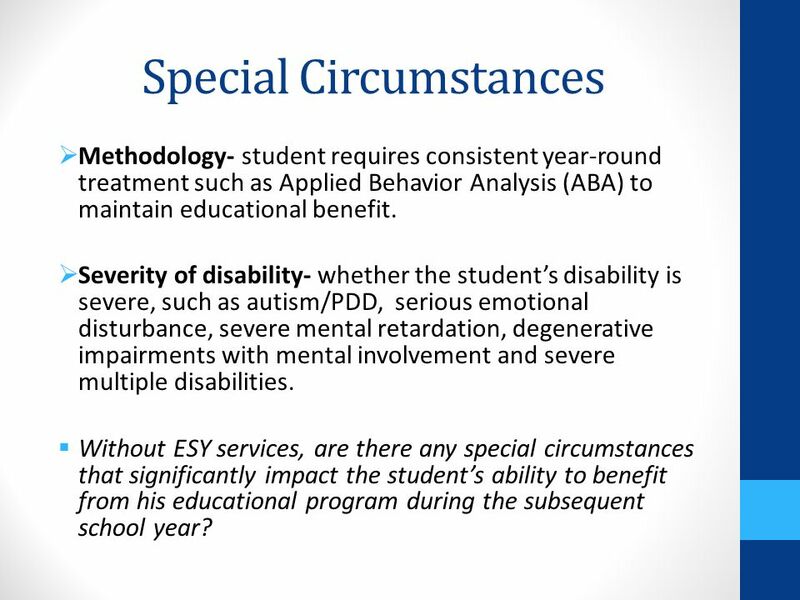 ESY is a Special Education service designed to extend the school year for a student with a disability based on specific criteria; determined by the IEP team. There is no academic “credit” given to ESY students. The purpose is to address critical life skills. The purpose is to maintain existing skills. Presenter: to stress that summer school is open to all students. 7 Regression Whether the student reverts to a lower level of functioning as evidenced by a measurable decrease in skills or behaviors which occurs as a result of interruption in educational programming. Regression must be evidenced by current data. 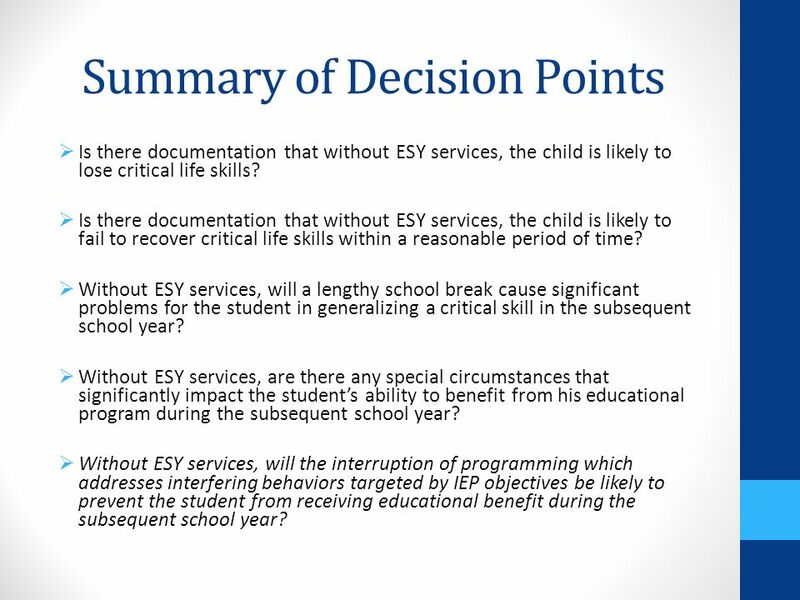 Is there documentation that without ESY services, the child is likely to lose critical life skills? 8 Recoupment Whether the student has the capacity to recover the skills or behavior patterns in which regression occurred to a level demonstrated prior to the interruption of educational programming within a reasonable period of time. Recoupment must be evidenced by current data. 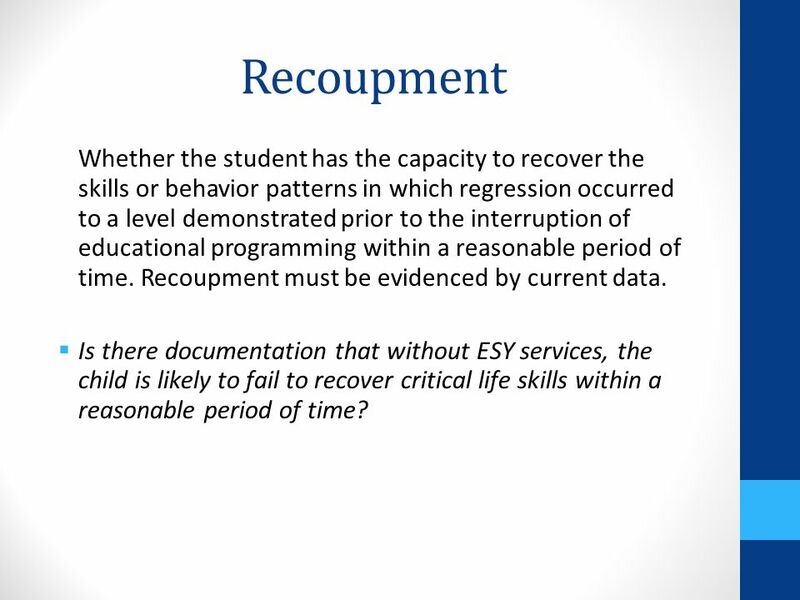 Is there documentation that without ESY services, the child is likely to fail to recover critical life skills within a reasonable period of time? The extent to which the student has mastered and consolidated an important skill or behavior at the point when educational programming would be interrupted as evidenced by current data. Without ESY services, will a lengthy school break cause significant problems for the student in generalizing a critical skill in the subsequent school year? Methodology- student requires consistent year-round treatment such as Applied Behavior Analysis (ABA) to maintain educational benefit. Severity of disability- whether the student’s disability is severe, such as autism/PDD, serious emotional disturbance, severe mental retardation, degenerative impairments with mental involvement and severe multiple disabilities. Without ESY services, are there any special circumstances that significantly impact the student’s ability to benefit from his educational program during the subsequent school year? Interfering Behaviors –The extent to which successive interruptions in educational programming result in a student’s withdrawal from the learning process as evidenced by current data. 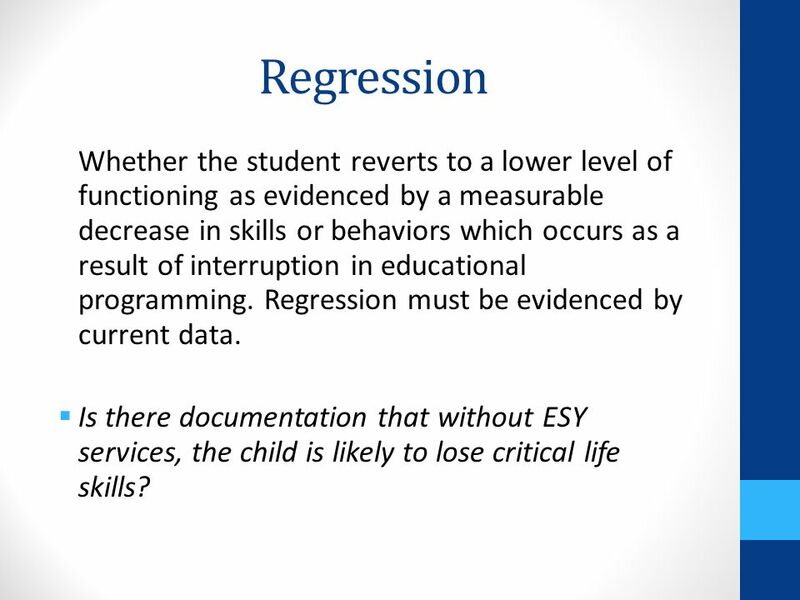 Without ESY services, will the interruption of programming which addresses interfering behaviors targeted by IEP objectives be likely to prevent the student from receiving educational benefit during the subsequent school year? Is there documentation that without ESY services, the child is likely to lose critical life skills? Is there documentation that without ESY services, the child is likely to fail to recover critical life skills within a reasonable period of time? Without ESY services, will a lengthy school break cause significant problems for the student in generalizing a critical skill in the subsequent school year? Without ESY services, are there any special circumstances that significantly impact the student’s ability to benefit from his educational program during the subsequent school year? 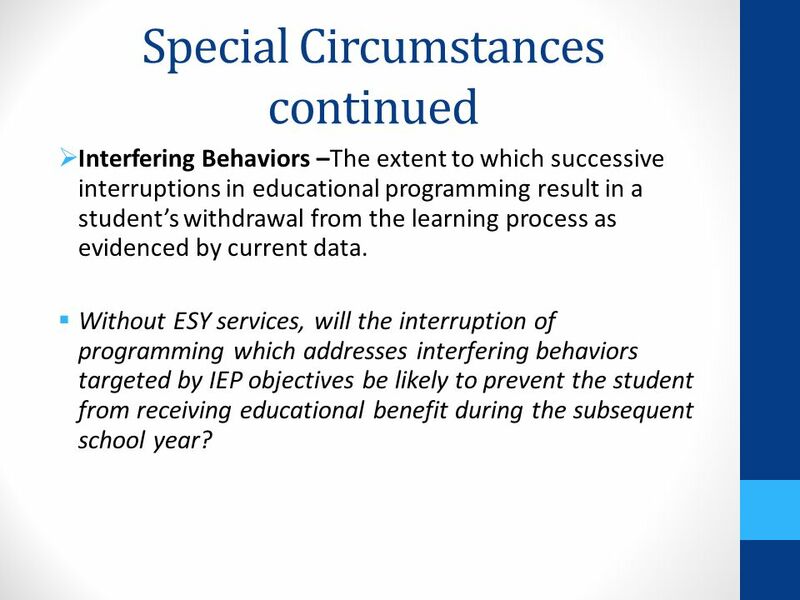 Without ESY services, will the interruption of programming which addresses interfering behaviors targeted by IEP objectives be likely to prevent the student from receiving educational benefit during the subsequent school year? 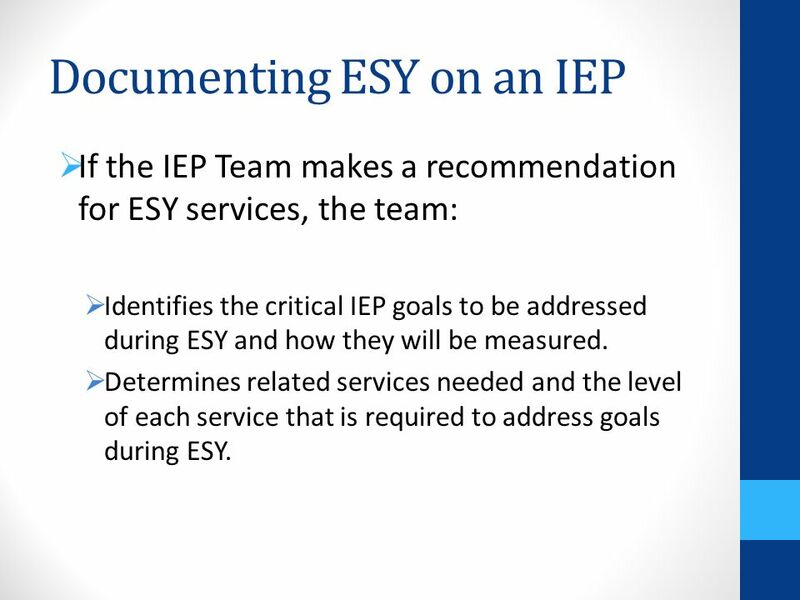 If the IEP Team makes a recommendation for ESY services, the team: Identifies the critical IEP goals to be addressed during ESY and how they will be measured. 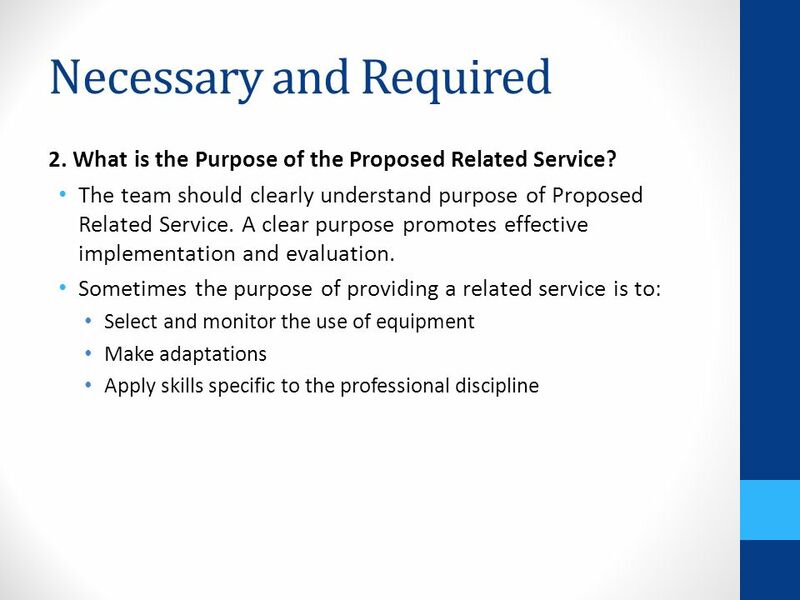 Determines related services needed and the level of each service that is required to address goals during ESY. 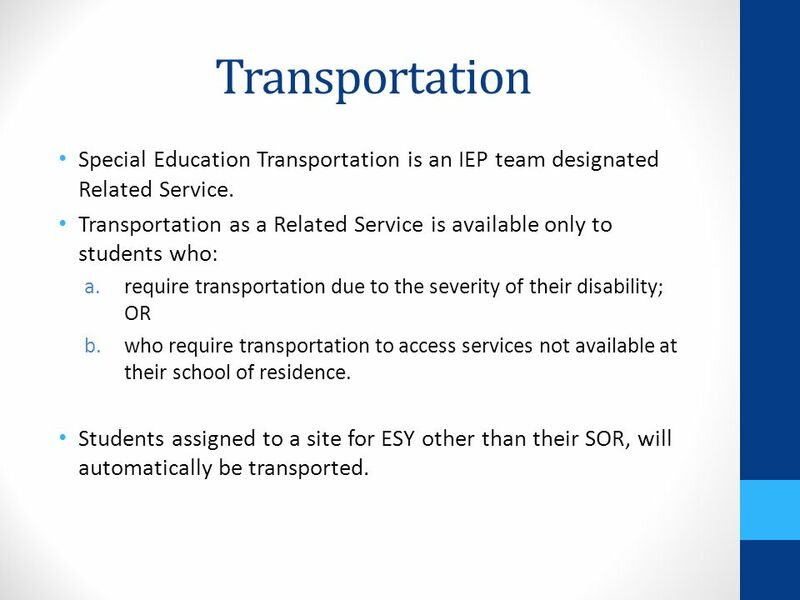 15 Transportation Special Education Transportation is an IEP team designated Related Service. Transportation as a Related Service is available only to students who: require transportation due to the severity of their disability; OR who require transportation to access services not available at their school of residence. 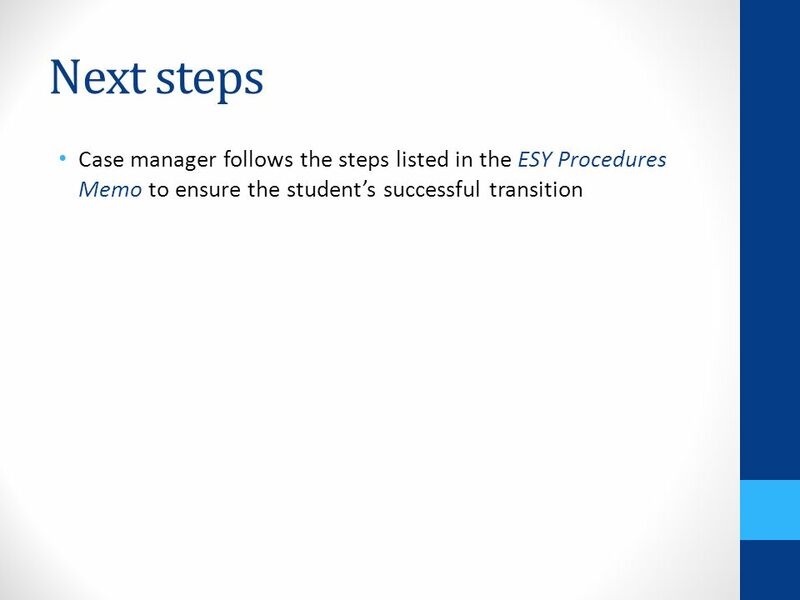 Students assigned to a site for ESY other than their SOR, will automatically be transported. 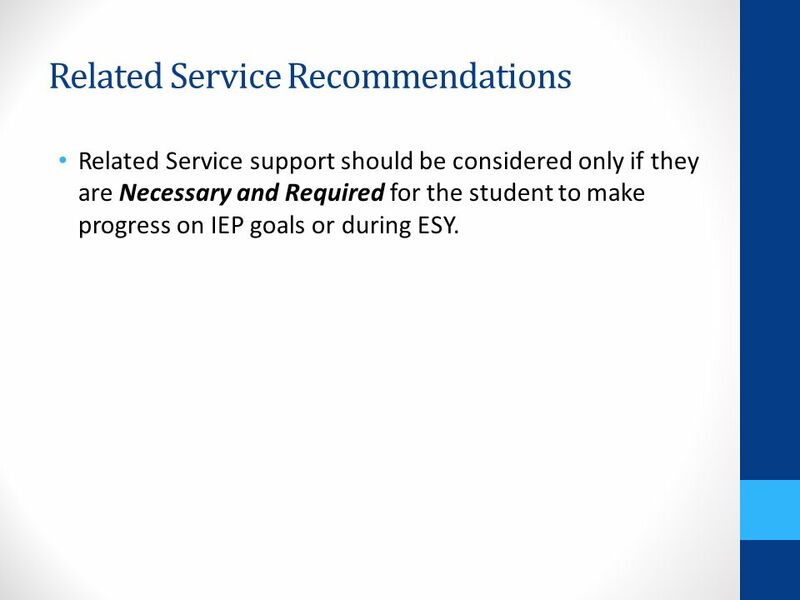 Related Service support should be considered only if they are Necessary and Required for the student to make progress on IEP goals or during ESY. 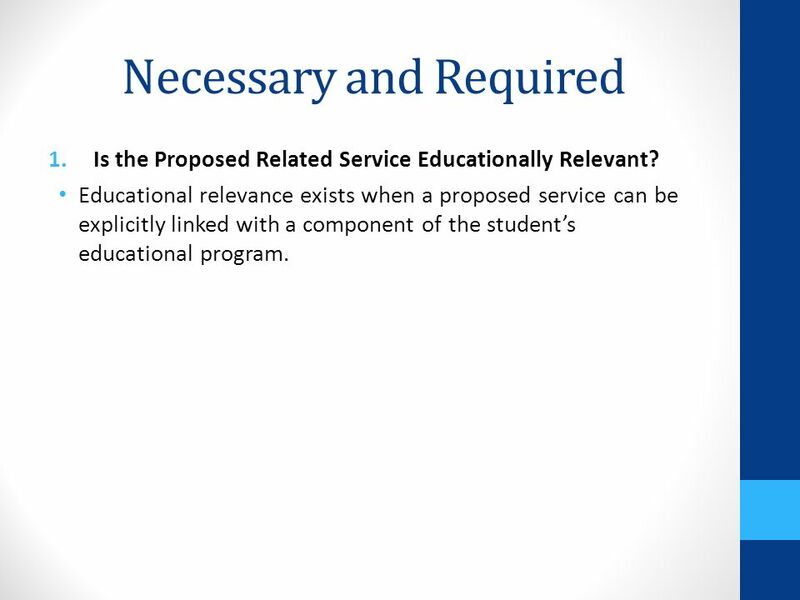 Is the Proposed Related Service Educationally Relevant? Educational relevance exists when a proposed service can be explicitly linked with a component of the student’s educational program. 3. 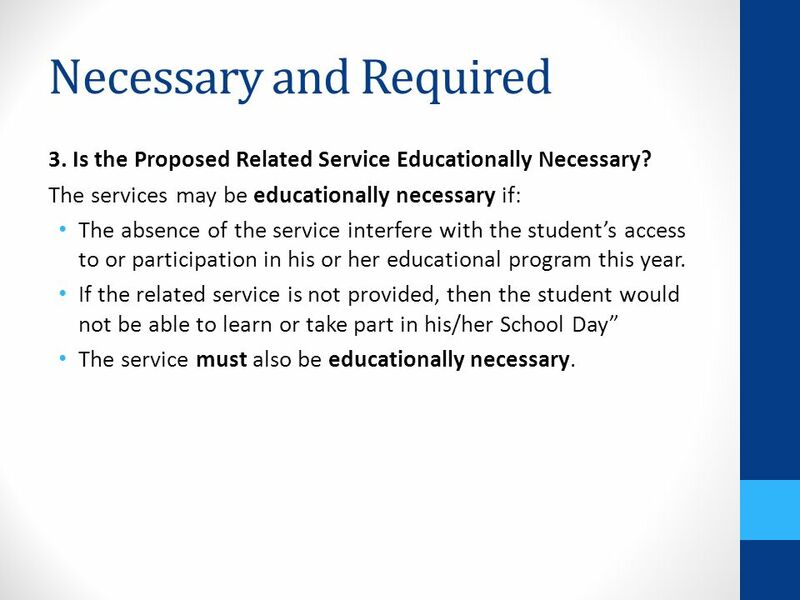 Is the Proposed Related Service Educationally Necessary? The services may be educationally necessary if: The absence of the service interfere with the student’s access to or participation in his or her educational program this year. If the related service is not provided, then the student would not be able to learn or take part in his/her School Day” The service must also be educationally necessary. All IEP team members support student goals and areas of need. There are no “Areas of Need” that belong to a specific related service. 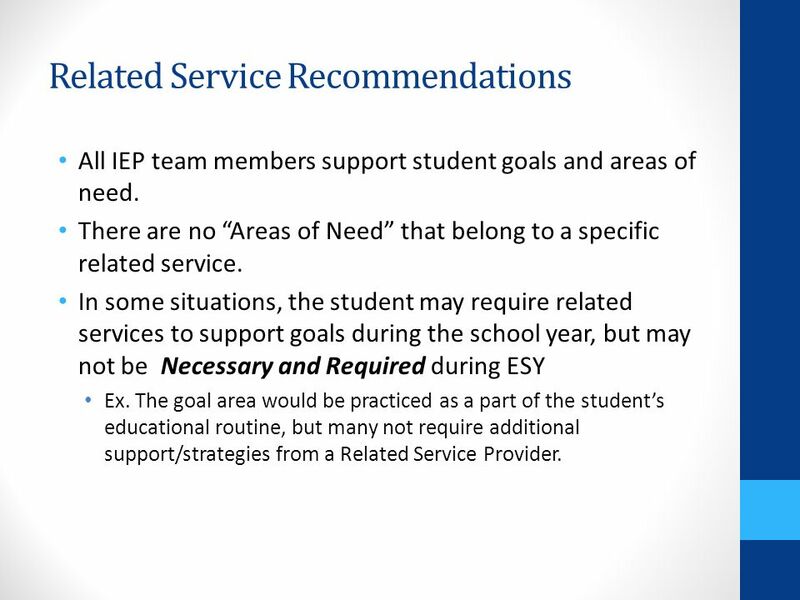 In some situations, the student may require related services to support goals during the school year, but may not be Necessary and Required during ESY Ex. The goal area would be practiced as a part of the student’s educational routine, but many not require additional support/strategies from a Related Service Provider. Download ppt "Extended School Year (ESY)"
ESY…Its Time!!! 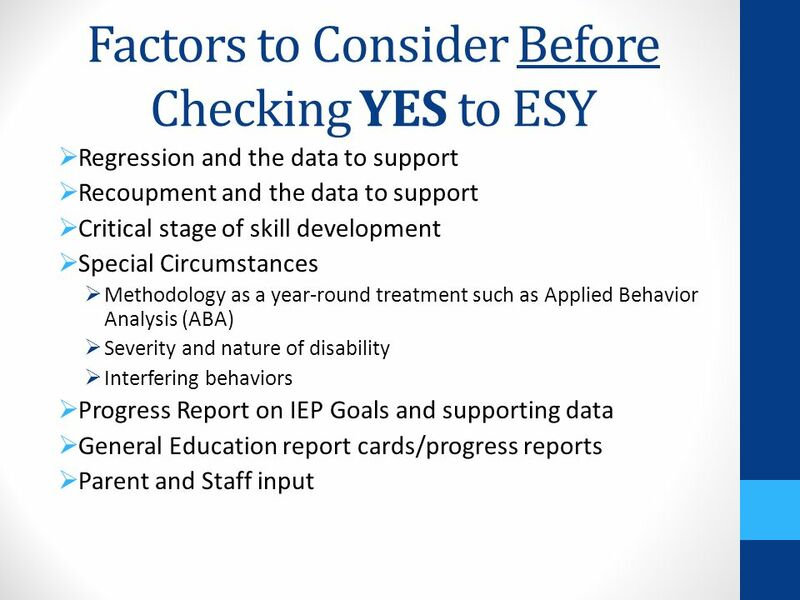 ESY needs must be discussed for every student in the IEP meeting. Often over-looked…dont miss it!!! Guidelines for Making Decisions about IEP Services IEP Services 2 of 8 Background and Legal Context. 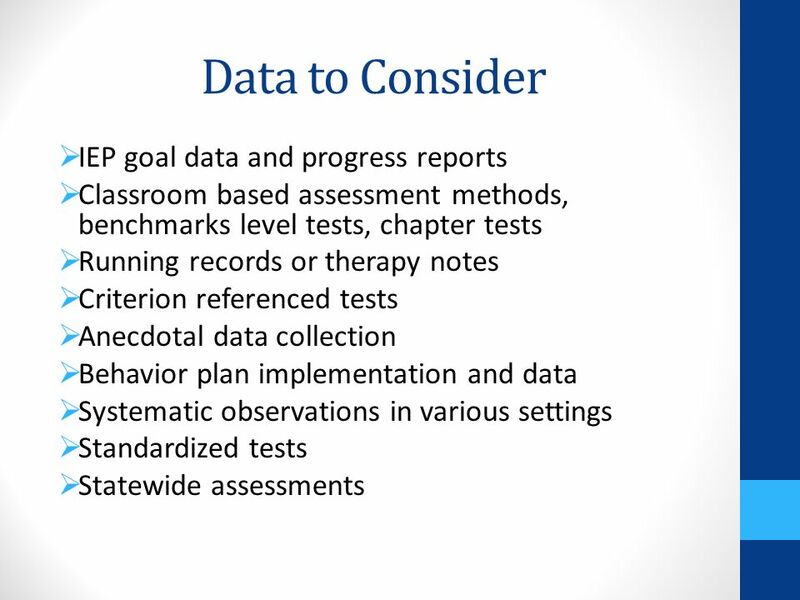 Session Objectives Participants will: –Briefly review the special education process –Understand the interaction between the Evaluation/Reevaluation Report. 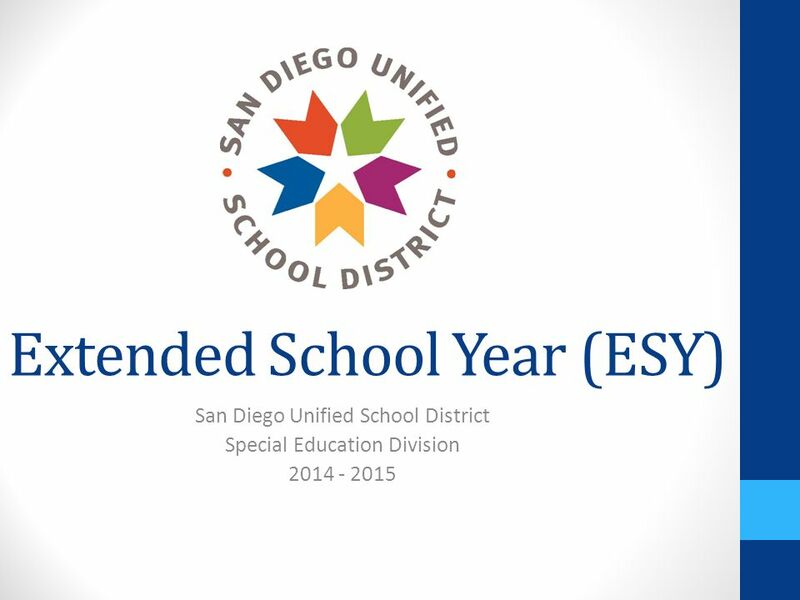 Extended School Year (ESY): Standards Adapted from Region IV Presentation August 28, Slides. IDEA and NCLB Accountability and Instruction for Students with Disabilities SCDN Presentation 9/06 Candace Shyer. 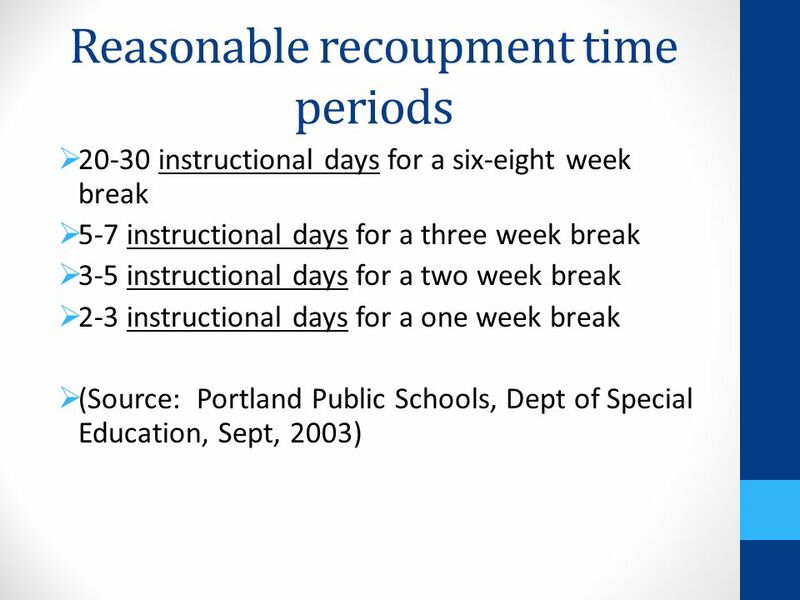 Navigating Extended School Year (ESY) By: Judd Fredstrom – Area Special Education Coop. Top ten non compliance findings from the Office for Exceptional Children from their Special Education Onsite Reviews. Exceptional Children Program “Serving Today’s Students” Student Assistance Team.